It's finally time to reveal what we've been working on since the start of the year. 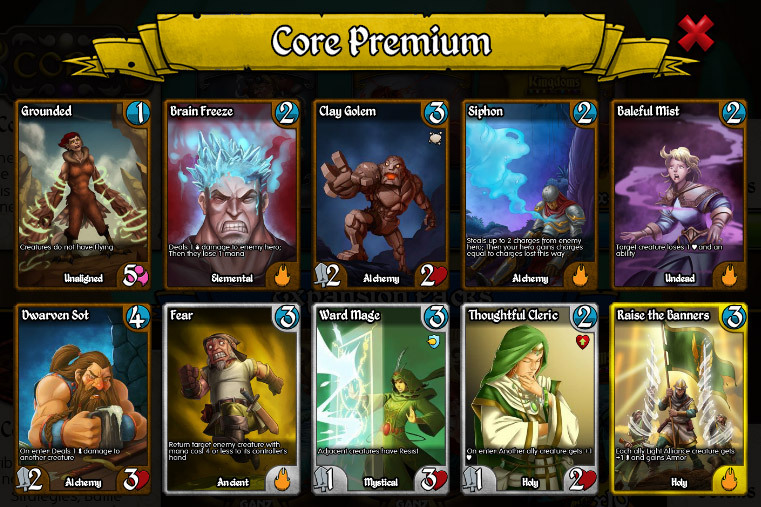 We have taken a hard look at Kingdoms CCG to see what's working and what's not. What will improve the experience? What will improve competitive play? What will make the game more inviting to new players? Like with the release of 2K sometimes you need to think outside the box to find success. 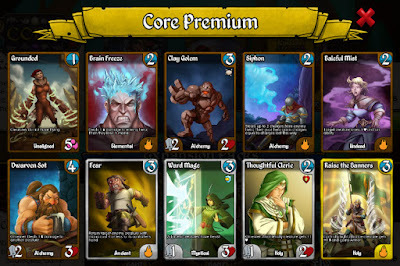 What is in store for Kingdoms CCG? Read on. What is wrong with this Core Booster? Answer: None of the cards are competitively playable. Okay, maybe Siphon in Limited, but that's it. This isn't a "bad" core booster. It's a pretty regular one. Of the 164 cards in Core, less than 20 cards have seen play in either Limited or Standard in years. This is a huge problem for new players. As Core packs are the cheapest to buy, new players are going to get a ton of these sub-standard cards, and will still have a difficult time building a good deck. New players would still have three sets to choose from, and it wouldn't be clear at all which pack to get first. It doesn't make getting the "good" cards any easier. Cheaper, yes, but the "good" to "unplayable" ratio remains very high. It doesn't help the game overall. There are still a ton of packs to choose from, too many sealed deck options, it doesn't make crafting easier and affords no opportunity to deal with problem cards. This last point is important. Any change needs to make the game better from as many angles as possible. There is also game balance to think about. We currently have over 1000 cards to choose from when building a deck. These cards were created and released over a four year period. Over that time we've learned a lot about what makes a card constructed playable, and now strive to make playable cards across all rarities, not just Rare and Epic. As a simple example, Clay Golem just wouldn't be a card any more. A three mana 2/2 would need a pretty significant upside - look at Frost Wielder or Ruthless Bloodsucker - or it would just be 2 mana, like Dunestorm Raider. A good Core Set should reflect this new reality. It should be a clear starting point for new players and should have a high percentage of cards that you wouldn't be embarrassed playing against a random opponent. Yes. We are redoing our Core set. The new Core set will include 229 cards from the original Core set, EVE, Rise and Tribes. 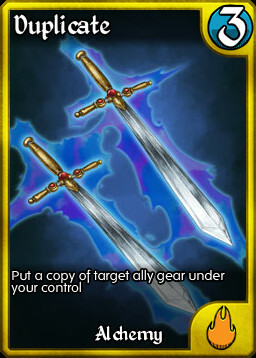 Every card in Core has been hand picked to be a relevant, playable card. Kingdom synergies and abilities have been brought into focus, their play styles made clear. When the new Core is released the older sets will be removed from the pack shop forever. The full set of cards will remain in the singles market for purchase, but will no longer be available through packs. The question will be, of course, what happens to the cards from the old sets that aren't in the new Core? As happens in the life of most CCGs, we have decided that it is time to reduce the number of cards in our Standard format. With the release of new Core set, all cards from the original Core, EVE, Rise and Tribes that are NOT included in the new Core will be removed from Standard and Limited play. All Arsenal/Guild Wars cards and Promos will remain in the environment. Tribes Two is currently slated to stay in the environment, but this may change. The benefit of this will be to reduce the number of cards from over 1000 to under 600. Players can debate whether or not a card like this is "broken" forever, but regardless of that discussion, Duplicate is a card that has allowed players to play 8 of a specific gear since the launch of the game. It has always been a concern when creating new Gear and has allowed numerous abusive situations. It's time to make powerful Gear to exist on their own accord (Dravkas not withstanding). One of our goals for the environment is to encourage a more interactive game with more creature vs. creature tactics, where tribal and Kingdom synergies can truly shine. To do this, a few of the game's most omnipresent and/or degenerate cards will need to leave, but by doing so, they will open up space for new strategies to emerge. Of course if you like making your 5th copy of Inverted Hourglass, all of the cards ever to have been made will continue to be playable in our Legacy format. We created Legacy last year with the release of the Two Kingdoms (2K) rule, but beyond allowing Guild Wars to remain in this format, we haven't really used it. With the upcoming Rotation, Legacy will be truly supported Kingdoms CCG format. Legacy will be added to the Arena. This will be discussed below. Constructed Tournaments will be streamlined to our three key formats. While our more "out there" formats can be fun to play, they have not been popular enough to support. To make room for Legacy in the Arena, and to clarify the differences between the formats, Limited will be officially renamed "Apprentice" and will replace the current, AI-only Beginner's arena. "Limited" is a term long used in CCGs to denote Sealed Deck/Draft play, so it has been confusing to new players. Prizing will be available for all three arenas, but we will keep the best prizing for the Standard arena. It is "Standard" for a reason, and play there will be encouraged. Finally, it is time to deal with one of the key issues with Kingdoms CCG once and for all. We are currently working on putting a hard cap on the number of gear that a player can have in play at one time. It has never made sense that gear have no limit - not even when they no longer appear on screen - and creatures be limited to just three slots, but this has been one of the sacred cows of Kingdoms despite the many issues it has caused over the years. Now is our chance to fix it. We are currently using a cap of 8 gear. This allows a deck to focus around 4 copies of two key gear, or one key gear and some support pieces. Like creatures, you will not be able to remove your gear without a card effect, but you can expect to see more card like "Recycle" in future sets. The Gear Cap: Is 8 the right number? Tribes Two: Stay in Standard or go? Guild Wars: Move to new Standard or stay in Legacy? New Core: What are the cards you most want to stay? Most want to go? Join the conversation on our official Facebook page. We will be regularly joining the discussion to address your questions, comments and concerns. Yahoo Games has announced that on May 13, 2016 it will be closing down. Since launching Kingdoms CCG on Yahoo Games in early 2015, we have had thousands of Yahoo players try the game and we want you to know that we are not going to let the closing of Yahoo Games prevent you from enjoying your accounts. Early next week we will be updating the Yahoo client. When you log into the game from Yahoo you will be asked to provide an email address and password. These will be applied to your existing account - all of your progress, cards and decks are yours to keep. When complete you will be redirected to kingdomsccg.com, where you can continue to play. Note that this account can also be used on Steam and our Android and iOS apps. We will post a follow up notice when the Yahoo changes have been made. At that time we ask that you clear your browser's cache to ensure that you get the updated version of the game. Remember that you must convert your account over before May 13th. After that time, access to unconverted accounts will not be possible. This feature will made available to Yahoo Games players only. Our agreements will other portals such as Kongregate or Facebook do not allow transferring accounts to dotcom. 1) Titan Arbiter no longer prevents creatures from gaining abilities while it is a corpse. 2) An exploit that would allow cards from opposite Kingdoms to be used in decks (i.e. Elemental cards in a Mystical hero deck) has been fixed. Decks can no longer be saved with illegal cards in them and both the Arena and Guild Wars will now reject such decks, even if they meet all other deck building requirements. 3) We've also added some new code to allow for some new creature abilities in future releases (this has no impact in the current game). Just a quick message to let players know that Kingdoms CCG will be down on Monday, March 7 from approximately 7:30 am to 9:00 am EST. We're doing network maintenance on our load balancers. We have also submitted a new build to Apple and expect to have it live early next week. We have fixed the bug with Titan Arbiter and a deck building issue that was raised on the forums. We're also pleased to say that we haven't had any reports of Guild Wars AI crashing since the fix in our last release (usually happening with complex, multi-Inverted Hourglass situations). If you do see this happening, please make a post on our forum, or let us know at kingdomsccgsupport@ganz.com. We are hoping that we've solved the issue once and for all, but Kingdoms is complicated code so there may still be fixes to go.